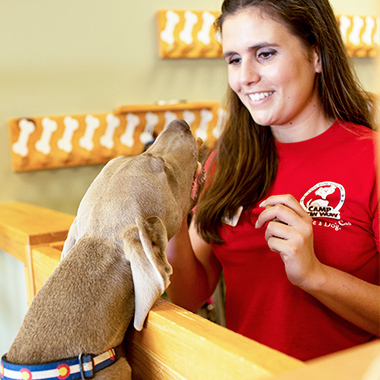 We’ll do everything we can to ensure your dog is happy and healthy during Day Camp and you can feel confident knowing your dog will be well-cared for during their stay in our safe and secure environment. Pass a (free) temperament test and stay for 1/2 day. Be spayed or neutered if over 6 months old. We STRONGLY recommend the Canine Influenza Vaccine and require it for Campers coming to our Camp from over 50 miles away. Canine Influenza is serious and can make dogs very ill.
Be on a monthly flea and tick medication. Oral or topical types are preferred; flea/tick collars are not allowed at Camp because they cannot be removed quickly in case of emergency. If you use a flea/tick collar it will be kept with your dog's leash while the dog is at Camp. Monthly Fun Pack is to be used in month purchased. Price is charged per day. 10 Fun Filled Days of Day Camp. Price is charged per day. For a low monthly subscription, you're pup gets unlimited day camp fun. Plus receive $20.00 off your first month. Package is available on Interview Day. Price is charged per day. Package applies to dogs from the same household. Price is charged per day. 15 minutes of one-on-one time with a Camp Counselor for extra belly rubs and head scratches. Specialized, personal attention for your pup, while your pup is at play. You pick the service and the number of sessions per day and we take care of the rest. Price is charged per session. 15 minutes of one-on-one time with a Camp Counselor to play Camper's favorite game (i.e. fetch, tug, etc.). Specialized, personal attention for your pup, while your pup is at play. You pick the service and the number of sessions per day and we take care of the rest. Price is charged per session.